Slower is better: It's playoff season for pro hockey and pro basketball, and after a player sinks the winning basket or scores the winning goal, you'll probably hear him say that it felt like time was slowing down as he took the shot. Obviously, time doesn't actually slow down, but that feeling illustrates that our minds have the ability to control our sense of time. Scientists have found that when preparing to perform a movement, the brain kicks into high performance mode, processing more visual information and creating a more vivid mental picture than it does when the body is at rest. “That makes time be perceived as longer and slower,” a researcher said. The brain also creates a more vivid mental picture when you see things you haven't seen before. This is one explanation for why time seems to speed up as we get older: If you've seen Fourth of July fireworks for 60 years, they aren't as vivid as they are to someone who is seeing them for the first time. Therefore, if you asked a 60-year-old and a 6-year-old how long a fireworks show lasted, the 60-year-old would probably give the shorter answer. TimePilot Q&A: Introducing a timeclock to employees; new OT policies. Lead Story: New product: Vetro Power Over Ethernet Kit. The Deal: $5 off the new Vetro Power Over Ethernet Kit. We have a new product that can make life easier for our customers who use their Vetro clocks on their local area networks. Our Power Over Ethernet Kit eliminates the need to have a power outlet near your Vetro clock. The kit turns your network cable into an “extension cord”—transmitting power from an outlet at your server or at your PC through the network cable to the clock. Besides convenience, there is another possible benefit: Most servers are used with an Uninterruptible Power Supply (UPS), and the Vetro power supply can be plugged into the UPS. This will keep the clock from losing the correct time during a power outage as long as the UPS is functioning. 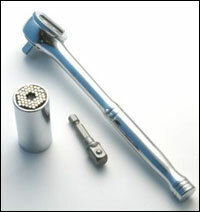 The kit consists of two 7-inch-long adaptors. Each has a network cable connector at one end and two leads—one with a network jack and the other a power lead—at the other. The kit will work with network cables up to to 75 feet in length. In the photo at right, the adaptor shown on the left is used at the clock; the one on the right is used at your server or PC. The network lead at the top of the adaptor is plugged into your router/switch/PC. The lead from the Vetro power supply is plugged into the power jack at the top of the adaptor. Your network cable plugs into the network jack at the bottom of the adaptor. The list price of the TimePilot Vetro Power Over Ethernet Kit is $29.95. However, for a limited time we're offering readers of this newsletter $5 off the list price. For details, please see below. Vetro Power Over Ethernet Kit! Just push it on and start turning. It fits virtually anything that isn’t round: hex nuts and bolts from ¼-inch to 3/5 inch, eyebolts up to 2 inches, wing nuts, square nuts broken nuts, hooks, etc. The Gator Grip comes in several versions: You can buy just the socket or the socket, a ratchet and power driver adaptor (so it can be used on a power drill).